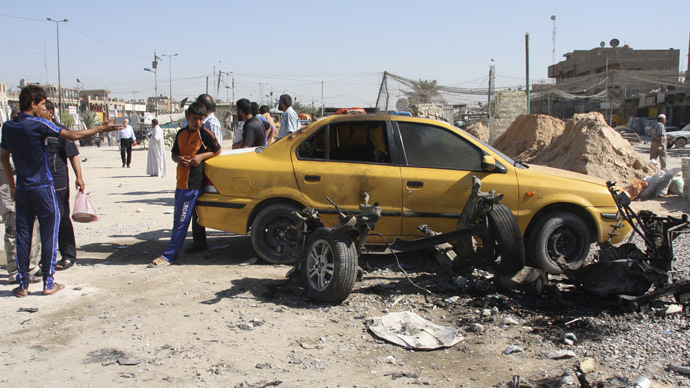 A string of bombs in what appears to be a coordinated attack in Baghdad has killed 38 people. Police sources told Reuters that the blasts were in mainly Shi’ite Muslim areas of the city. However, there was also an explosion in the predominately Sunni Muslim neighborhood of Doura. Police said that there were reports of seven explosions in eight different neighborhoods, adding that the attacks mostly involved car bombs and hit commercial areas in the city. In the deadliest attack, a parked car bomb killed six and wounded 13 on one street alone, police said. Religiously mixed neighborhoods were also targeted. In a separate attack four members of a government backed Sunni militia were killed in a roadside bomb in northern Baghdad and a policeman died fighting militants in Hilla, 100 km north of the capital. 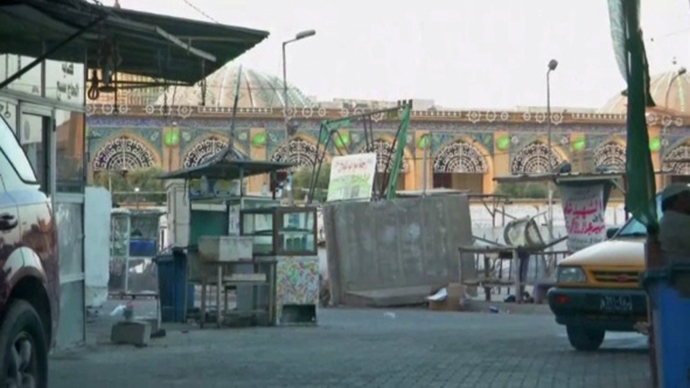 No group has yet claimed responsibility for the attacks, but the vast majority of such bombings are the work Sunni Islamist insurgents often allied to Al-Qaeda who are seeking to destabilize the Shi’ite government and stoke up sectarian conflict. Earlier Al-Qaeda claimed responsibility for a number of rare suicide bombings in the relatively peaceful self-ruled Kurdish region in the north of the country. On September 29, twin suicide car bombs killed Kurdish troops and wounded at least 30 others. 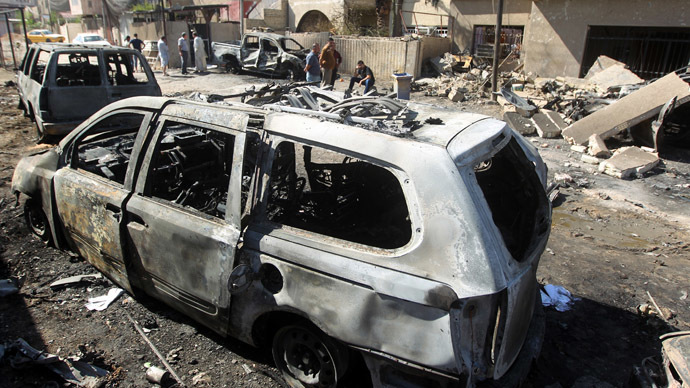 Monday’s bombing comes after days of havoc in Iraq, which has killed hundreds and injured thousands. On Sunday two suicide bombers blew up vehicles at a school and a police station in northern Iraq, killing at least 15, 12 of whom were children. While 14 more people were killed on a cortege of Shi’ite pilgrims in Baghdad. On Saturday 72 people were killed in another raft of attacks, when a suicide bomber hit Shi’ite pilgrims who were passing through a Sunni neighborhood en route on a Shi’ite shrine. Another attack took place in a café in a Shi’ite neighborhood and in a separate incident in the northern town of Mosul two journalists were abducted and shot dead. The conflict between Sunni Muslims and Shi’ites in Iraq has mushroomed over the past year amid fears that the country is sliding towards a full scale civil war. The situation in Iraq has been inflamed by the fighting in Syria, which has drawn in fighters from both sides of the sectarian divide. 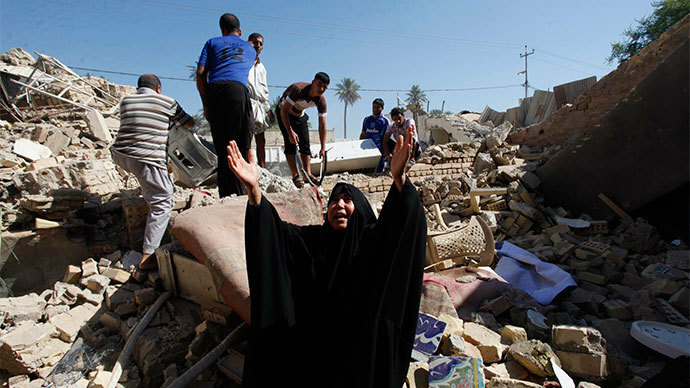 More than 6,000 people have been killed already this year, as Iraq slides back to levels of sectarian bloodshed which reached a climax in 2006-2007, while US troops were still stationed in the country. Almost all the attacks have been claimed by Al-Qaeda.